I use an RSS feed reader to manage all of my news. I promise that soon I will write about my favorite news reader (Inoreader – for those in the know, it’s what Google Reader could have been). Really, everything newsworthy, I send through Inoreader, including Twitter accounts I want to keep an eye on and a Twitter search for my Twitter handle so I can keep track of what is being tweeted about me without having to do frequent check-ins with Twitter or Hootsuite (my preferred social media manager). Inoreader used to have the ability to bring in Twitter feeds, but at some point in the recent past, that functionality broke. That, of course, meant searching for a work around. 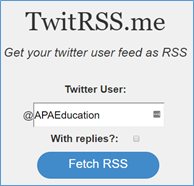 But how to get Twitter converted to an RSS feed? TwitRSS.me is the solution. … and TwitRSS.me converts what is being sent out by that Twitter account into this mess of code. Then I copy the URL for that mess of code and save it in my news feed reader. And the tweets magically appear. Any new tweet from that account will pop in at the top of this list. 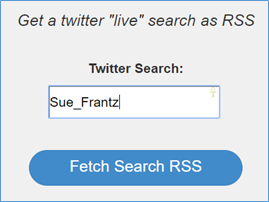 Since I want to keep track of any mention of me on Twitter, I entered my handle (minus the @) as a search term. You could enter any search term here, including hashtags. That generates a different mess of code. Then I copy the URL for that mess of code and save it in my news feed reader. And the tweets magically appear. Any new tweet that results from that search will pop in at the top of this list. 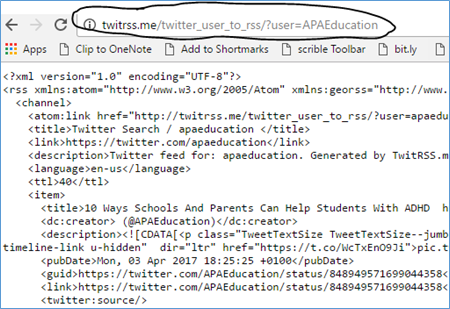 What I love about dropping Twitter into Inoreader is that each tweet can be tagged so I can find them more easily later. 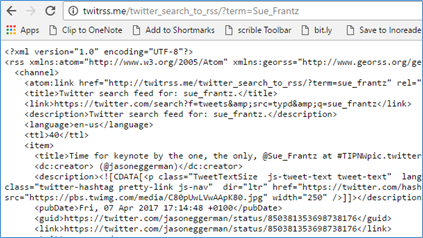 For instance, I can tag Inoreader content, including these tweets, with “SueFrantz.com” if I think the content might make a good blog post. Now that I’ve shown you how to convert Twitter to an RSS feed, I may finally get around to writing a post on Inoreader.